So last Friday Bonnie Hunter released the step 3 of the Orca Bay mystery. I was very busy on the Friday and the rest of the weekend with a Christmas Party and a Dog Agility Trial. I finally have had sometime to sew in the evenings for myself. 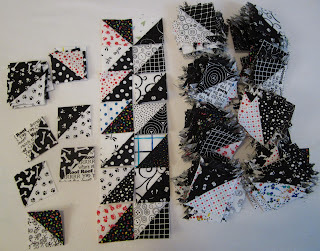 I have all 350 little (2"unfinished size) triangle sewn and a few more (maybe 100) to trim up. I should be good to go and sew on step 4 on Friday night. I will see if I can still do the linky thing on Bonnie's Blog. It is Here if you want to see more about step three. If you think you may want to do this quilt you should be printing the pages as she releases them. I think it is May she will be taking the quilt steps off her blog as it will be printed in her new book. Or you can wait for the new book sometime later in the year. Friday in the day I am in a class with Karen McTavish the machine quilting goddess. She is in Edmonton this week. Tonight is the trunk show at the Sherwood Park Quilt Guild. This week she is teaching a large arrangement of quilting classes. Friday is Whole Cloth Design which I am taking. I have my fabric washed and dried but not ironed and squared up yet. I also have to go to the quilt store and get a handful of those pen wash out pens. I do wish I had more money to take more of her classes but with Christmas coming I am only in one. I will let you know how it goes. I love how some people are starting to guess how this mystery is going to be put together! Lucky you going to a Karen McTavish class, I have all her books and would love to go to a class. I hope you learn lots and have fun too. Beautiful job Cathy. Aren't those string blocks so much fun. I envy you taking a class with Karen McTavish...should be fun! I love the fabrics your are using. I can see you have a sense of humour! How great to be doing a Karen McTavish workshop. Ohhh...Karen McT. I have her book and DVD, and they are a great combo. Even I, working on a modest domestic machine, can do some McTavishing! And your units are pretty, pretty, pretty... Have a great weekend! the blocks look great together. See you tonight at Karen McTavish...really looking forward to it. 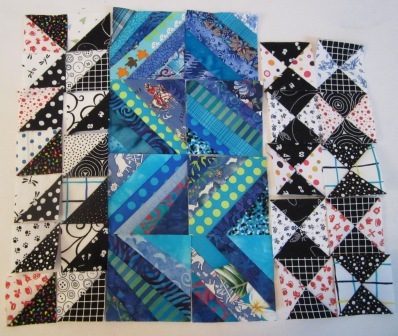 You are making great progress on your Orca quilt- I am sure it is going to be another lovely one. Have fun at the Karen Mactavish class- it would be wonderful to take a class from her.. I am sure you will learn lots. You will have to let us know how the class goes, it would be great. I need to go sew some more; just trying to decide if I should finish step 1, 2 or 3 or start 4. I think I'll start 4 as that will be orange strings and I can't wait to play with my oranges.